One could argue that, while the production, significance, and language of the plays of Shakespeare remain unimpeachable, their duration might present problems for audiences with ADD or otherwise short attention spans, things to do, and the desire for adrenaline thrills, not those nurtured from delayed gratification. 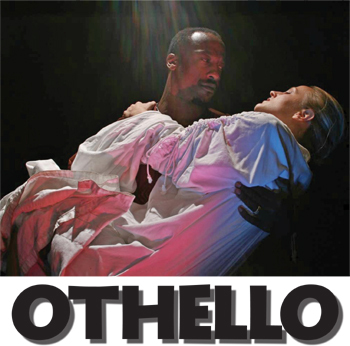 The Long Beach Shakespeare Company's production of Othello, directed by Helen Borgers, suggests these concerns are ill-founded. For that we can thank Maurice Shaw's charismatic performance as the doomed Moor. Externally impregnable, emotionally a lot more fragile than his physical presence might suggest, he appears to be carved from onyx. A high-minded soldier and civil servant loyal to the Duke of Venice (Mike Austin), he stands before us, from the start, both stalwart and fragile. While he proclaims that he can compartmentalize his love (secret, forbidden) for Desdemona (Erica Sims), daughter of Senator Brabantio (Carl Wawrina), at the same time that he can lead his men against the Turks, his mental composition is a little more marital, a little less martial. The point is pounded home by his ignorance of the insidious intrigues of Iago (Mark Aguirre), his two faced and supposedly loyal advisor, and of the indifference of the Duke, for whom he is a fighting machine, not an unstable human being. We can also thank Aguirre for his utterly convincing portrayal of a hypocrite who seamlessly cavorts among his peers as a team player and yet brags without shame to the audience of the havoc he intends to wreck. Like Shaw's Othello, Aguirre's Iago is, superficially at least, upbeat, optimistic, a patriot. Unlike his so-called friend, he is also duplicitous, venomous, and Machiavellian in his intrigues. He can charm and befriend Desdemona and the otherwise guileless Roderigo (Brandon Cutts) and Cassio (Benny Briseno). In short, Aguirre presents him as the opportunistic bounder that he really is. Finally, kudos to the rest of the cast. Sims' Desdemona. In that white gown, with those beaming eyes, especially in the company of Othello, and the way she glides over the stage, she's the paragon of innocence, exquisitely unaware of the fate that awaits her and everyone and everything that she holds dear. Cutts and Briseno, one obviously hapless, the other less so, excelled as puppets pulled by the strings of Aguirre's Iago who, throughout the production, felt more and more like Heath Ledger's Joker, minus the face paint. Credit for all this must go to Borgers. Staging full or nearly-full versions of Shakespeare in a black box theatre, she proves that it's the words, not the spectacle, that matter. And so, with nothing more than simple sets, some nifty swordplay, always-welcome live music, and actors that bring the Bard to life, she also proves that, with character development, eloquent articulation, and economical gesture, the play, all three glorious hours of it, remains the thing. Performances are 8pm, Fri. & Sat., 2pm, Sun. The show runs until Apr. 2. Tickets are $10-20. The Theatre is located at 450 Atlantic Ave. For more info call 997-1494 or visit www.lbshakespeare.org.